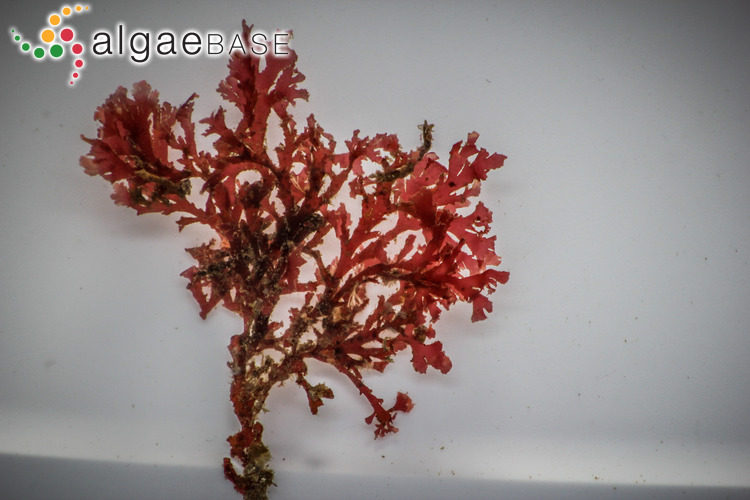 subtidal species typically covered in encrusting animals such as bryozoans and hydroids. 24 Oct 2014. Bridgette Clarkston. © 2014 Bridgette Clarkston. Published in: Clarkston, B.E. & Saunders, G.W. (2010). 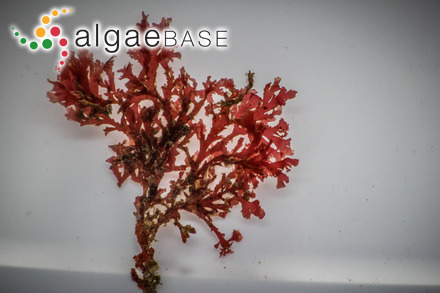 A comparison of two DNA barcode markers for species discrimination in the red algal family Kallymeniaceae (Gigartinales, Florideophyceae), with a description of Euthora timburtonii sp. nov. Botany 88: 119-131. "Named for Tim Burton, because the alga and its common substrate (polychaete worm tube) together resemble a macabre flower in the style of T. Burton’s artistic contributions." Plants exclusively subtidal, commonly epizoic on polychaete worm tubes. Thalli highly branched; overlapping branches frequently fuse together. Branches are a consistent width throughout individuals, 1.1–2.8 mm wide near base, penultimate branches 0.5–2.4 mm wide. Branch apices blunt. Thalli 170–205 µm thick. Medulla of large, unpigmented, oval to isodiametric cells (55–95 µm). Small unpigmented cells between large cells present, but typically cryptic, most abundant in basal regions. Type locality: Wizard Islets (Lat: 48.85838°N, Long: 125.15888°W), Bamfield, British Columbia, Canada. (Clarkston & Saunders 2010: 121). Holotype: B.E. Clarkston & S. Toews; 3 June 2008; subtidal at 40 ft. on worm tube. NBW GWS010572 (Clarkston & Saunders 2010: 121).